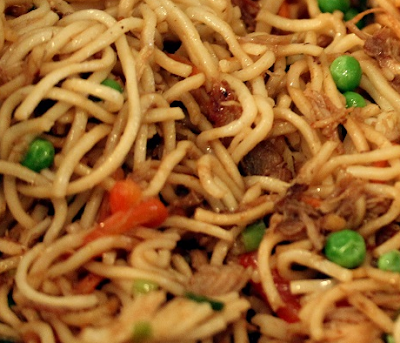 La mein means pulled noodle and these are the oldest noodles discovered in China. Hand made noodles with twisted dough pulled and stretched until long thin piece is produced. Noodles in China date back ancient history and one of the written proof is from a book dated to the Han dynasty (206 BC – 220 AD) Noodles often made from wheat dough, became a prominent staple of food during the Han dynasty. In 2002 archaeologists found an earthenware bowl containing world's oldest known noodles, about 4000 years old. 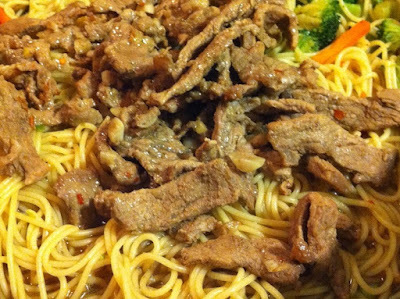 In a bowl add meat strips, salt, soy sauce and cornstarch and marinate the meat well, set aside. Heat some oil and cook marinated meat till brown. To make sauce add Wooster sauce, beef broth, soy sauce and sugar in a bowl and mix well. 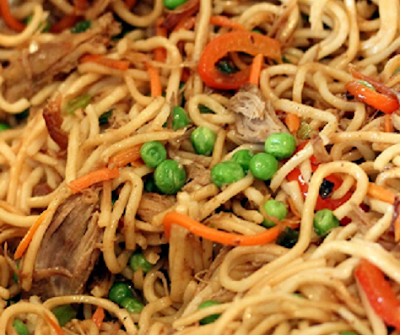 Heat oil in another pan and add cabbage, carrots, green peas and garlic paste and cook well, add noodles and cook for 3-4 minutes, add cooked meat and mix.